Occlusion (Latin, occludere = to close; closure of the teeth) generally denotes each contact between the teeth of the maxilla and the teeth of the mandible in a dentition.The status of tooth contacts in occlusion is covered by various terms intended to describe the diversity of possible mandibular positions in which tooth contact takes place. There are also terms used to describe the tooth contacts that deviate from normal. The following paragraphs outline the distinctions among terms. Centric occlusion or terminal occlusion refers to closure of the dentition in which all the teeth are loaded centrally in respect of their periodontal tissue and the teeth are positioned with maximum multipoint contact (maximal intercuspa-tion) in the sagittal and transverse directions (Fig 7-22). The condyles lie in a pressure-free centric position in terms of their articular fossae, approximately 1.0 to 1.5 mm in front of the rearmost position possible. As the dentition grows, the occluding masticatory surfaces become arranged so that the periodontal tissues are loaded exactly centrically and the masticatory force is directed onto the middle of the periodontal tissue. Centric occlusion describes the correct physiologic loading state of the teeth involved and the TMJs. By contrast, the term harmonious occlusion denotes the state of idealized closure of the dentition in which all coordinating tissues of the masticatory system are harmoniously matched and absorb the load from masticatory force without interference in the periodontium, the joints, or the musculature. In harmonious occlusion, a maximum of masticatory work is performed with a minimum of muscular force. Maximal intercuspation (or intercuspal position) is the smooth interlocking (intercusping) position of cusp and fossa with maximum multipoint contact of the antagonizing cusps. 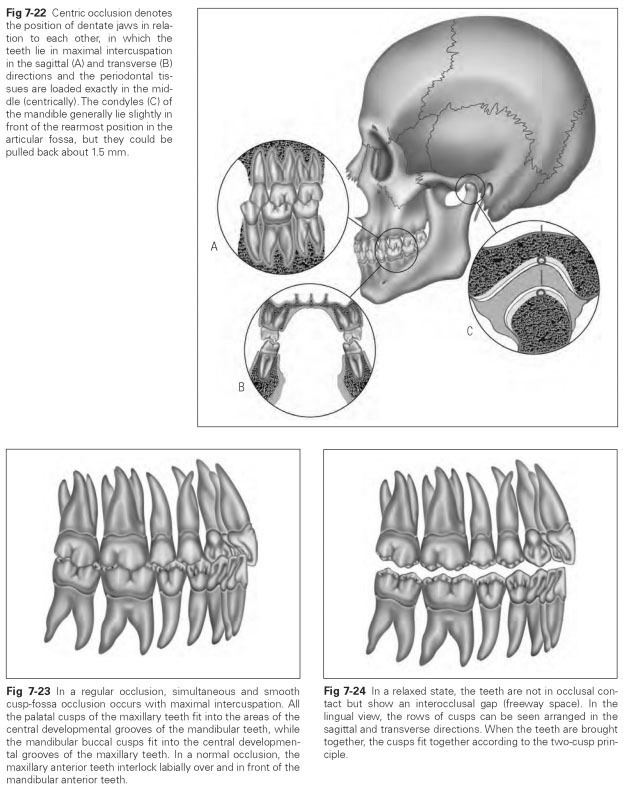 In a normal dentition, the anatomical surfaces of the teeth, especially the oblique surfaces of the cusps, permit only one final position in which uniform contact on all sides exists (Fig 7-23). In centric occlusion, the teeth of a normal dentition are supposed to fit together in maximal intercuspation so that the transfer of forces runs axially in the teeth involved and the periodontal tissues are centrically loaded. The following paragraphs describe the relationship between tooth guidance and neuromuscular guidance and its corresponding terms. Habitual intercuspation (or habitual occlusion) denotes the closure position of the teeth adopted as a result of habit, in which the reflex is to guide the teeth out of a wide opening movement into static occlusion. Ideally, maximal intercuspation would thus be achieved. The system of muscles and nerves is programmed to this centric position of the dentition.This is because a specific individual movement habit also develops during growth of the dentition, which then continues to progress in a reflex fashion and is based on occlusion of the two jaws. This is why centric occlusion with maximal intercuspation and habitual intercuspa-tion are the same thing in a normal occlusion. Physiologic rest position is the neutral position of the mandible in relation to the maxilla (unconscious maintenance of space between the jaws) adopted by reflex and held by the resting tension of the muscles, without any tooth contact (Fig 7-24). In this neuromuscular resting position of the mandible, all the muscles of mastication have a specific length. In the relaxed state, the mandible opens out of centric occlusion in a pure hinge movement of a few millimeters and is suspended in muscular guidance; the lips lie together without pressure. In this habitual position, the teeth have what is known as freeway space, the amount of which can fluctuate with the circadian rhythm. The physiologic rest position can be reproduced in edentulous patients and can be used to determine the occlusal height. Static occlusion is the terminal occlusal position when there is full contact between mandibular and maxillary teeth in the resting position. Dynamic occlusion or articulation denotes the tooth contacts during mandibular movements where the centric stops move out of the contact areas on the antagonizing triangular ridges of the cusps and on the tooth guidance paths (articulation paths). The tooth contacts in dynamic occlusion occur during regular chewing movements and are therefore a particular focus of analysis. Eccentric occlusion, a term used to designate all tooth contacts deviating from maximal intercuspation, can be seen as a synonym for dynamic occlusion.